Southfield attorney Todd Stearn was affected by the fact that his grandfather lost part of his arm in a rollover bus accident as a young boy without receiving any compensation. Stearn became an attorney to feel like he’s making a difference for his clients. An MAJ member for many years, as well as a monthly JUSTICE PAC contributor, Stearn has become more active recently, including serving on MAJ’s Executive board for the past three years. “As the tort deform revolution has impacted all of our practices as our state has veered to the right, there are really very few voices speaking out for injured victims or the under-privileged. It is important to support a group that not only keeps our message in the ears of our legislators but serves as the conscience of our state,” said Stearn. Some of Stearn’s favorite benefits from MAJ membership include the listserver, annual no-fault seminar, and the expert deposition bank. 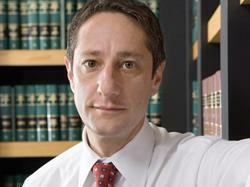 Other MAJ members introduced Stearn to David Ball as a resource of trial lawyers. Stearn and his wife Terri have been married for nearly 20 years and they have a 12-year-old daughter. When he was 30, Stearn was elected as the youngest mayor of Beverly Hills, serving as mayor for four terms and on the Village Counsel for 10 years. In addition, Stearn plays guitar, is a certified scuba diver, and has run the Thanksgiving Turkey Trot every year since 1993.